While the majority of cameos are made of shell, and have been since the 15th century, these miniature sculptures were also carved from various shades of lava as early as the 17th century. By the 19th century, souvenir cameos were being made of low-grade gold. Historically, gold cameos can be of interest, but their value is minimal compared to shell or hardstone examples. Jet√¢‚Ç¨‚Äùpetrified driftwood-served the same purpose. Coral and ivory are infinitely more decorative, and their use was popularized during the Victorian period. Many of the finer pieces came from Italy. 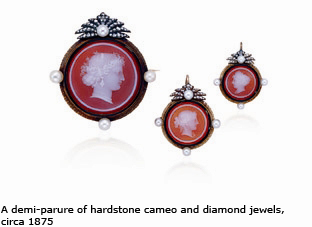 Hardstone cameos are those made of banded agate, onyx and sardonyx. They are the epitome of cameo art, and their monetary value reflects this. The use of hardstones dates back to ancient Rome . The material is more expensive than shell, and carving and polishing requires more time and skill. 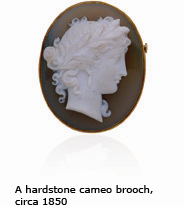 It is possible to achieve far greater detail and more lustrous background in a hardstone cameo. A good polish is time-consuming and difficult to achieve, and therefore adds significantly to the value. Both subject matter and setting can help date cameos. Craftsmen in the late 18th century produced pieces with noble and powerful subjects, reflecting the revival of the art of classical Greece and Rome . Male profiles, more atypical than female subjects, were represented as philosophers and emperors. Females were often depicted as mythological figures, such as Minerva, goddess of wisdom. These were generally set simply and elegantly in understated Roman-style seal settings as brooches, pendants and rings. On occasion, several examples were collected together in a themed necklace or bracelet. An entire collection that is still intact is rare and these sets are therefore more valuable than the sum of the individual pieces if they had been separated. In the early 19th century, entire groups of mythological figures and animals were depicted in series of cameos forming necklaces or bracelets, and in the 1830s and 1840s, settings became more elaborate. By the time Queen Victoria ascended the throne in 1837, cameos were characterized by romanticism and femininity, along with a revival of subjects from classical mythology. Minerva, Medusa (with snake hair), and Bacchante (the dancing muses) were widely popular, as were ladies in contemporary Victorian dress. Others from the same period, were quite large, often depicting allegorical scenes, and were well suited to the voluminous garments of the period. Classical subjects remained popular through the 1880s, with the best cameos executed in bold hardstone, in high relief and with fine gold frames, decorated with twisted wirework and elaborate decoration. Not surprisingly, the female profile, the most common subject, reflects changes in taste toward feminine beauty; long, aquiline noses were popular pre-1850, while a slight upturn characterizes noses after that date. Some of these are habille (dressed-up), with inlaid precious and semi-precious stones, which were popular in the late 19th century. Even hairstyles can help date a piece; upswept was popular late in the 19th century, upswept was popular late in the 19th century, contrasting with short curls at the beginning of the 20th century. But by that point, the popularity of cameos had begun to fade, along with a lot of the Victorian culture that disappeared with the new century and the onslaught of war. Condition is the most important element to consider when estimating the value of cameos, regardless of size or subject matter. Be especially careful with shell cameos, the most common variety, because the material is soft. They fracture easily and, in some cases, valuable original details have been rubbed smooth from over-use or poor storage. It it’s a rare subject, or more elaborately detailed, some damage is acceptable √¢‚Ç¨‚Äú in fact, given cameos’ age and slight damage is to be expected. Hold the object up to a good light to be sure it’s sound, and always use a loupe or strong magnification. This will help you to ensure the piece isn’t made of two layers glued together, which is a popular forgery technique. Beware of any damage at all to hardstone cameos. For obvious reasons, they’re more durable than cameos made of other materials, and pristine examples are easier to find. Regardless of material, value is impacted by large fractures that have cut through the depth of the piece or chips to key features such as the nose or clothing. Reproductions of older subjects began to appear in the 1930s. Look for machine marks, especially on backgrounds, where the surface should be silky-smooth. As a final checklist, look for strong contrast between background and foreground shading which is the ideal in both shell and hardstone. Therefore, the background and foreground color should not be blurred by variance in shading. Regardless of size or subject matter, the greater the complexity and quality of the carving, the better, but don’t neglect to double-check the condition.